“Entryway” is rather a generous term for this, which might more aptly be called “the corner by the refrigerator.” When I bought a new stove for this house, it took the place of the old refrigerator. The previous stove was a laughable little Magic Chef that used to reside next to the sink, where I now have a dishwasher. So now, I have my stove and refrigerator in a line on the short wall where there used to just be a refrigerator. The results of that switch are twofold: one, I can actually cook in this kitchen and two, the access to the side door is a bit tight. This is one of the things that’s frustrated me as I try to learn to live with this space—I just don’t know how to solve this corner. I use this door rather than the front door because, especially in the winter, the front steps and walkway are inconvenient from the driveway/garage. 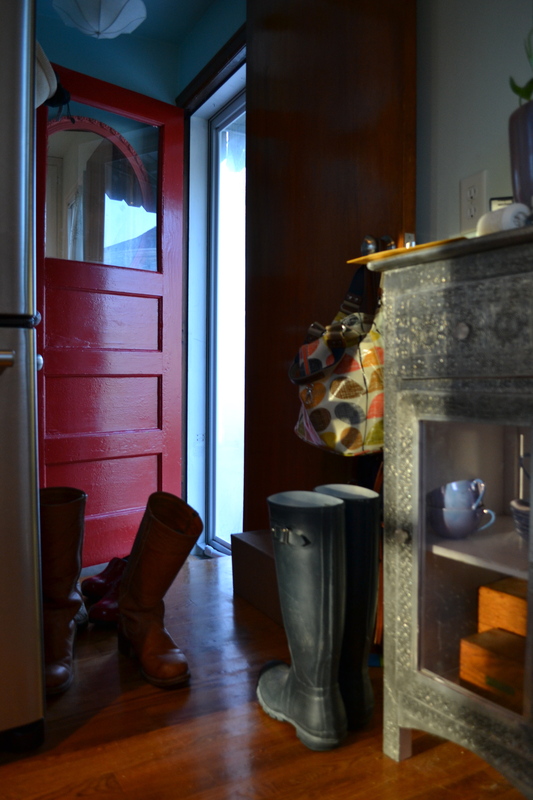 Opening the front door lets a lot of cold air right into the living room (and, potentially, lets cats right out of it). It would probably also help if I didn’t hang three purses on the doorknob—there’s a door that separates the upstairs from the downstairs, but since my cats need access to the basement, I leave it open. And use the doorknob for storage, apparently. I’m generally quite neat (ok, fastidious), but for some reason I’ve become a shoe slob. 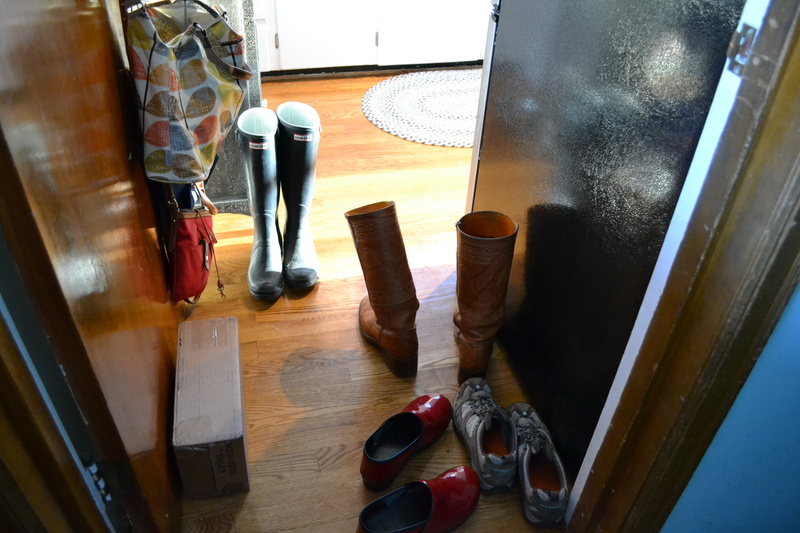 What are my wellies doing in the kitchen? Seriously. I can’t really think of anyway to make this space any better, so I just live with it. I’ve thought about taking the interior door down—after all, I seldom use it. Maybe I’ll try. Or maybe I’ll just put my shoes away. That might be a good first step.